Militant asserts that persecution of Christians is fundamental to Islam. 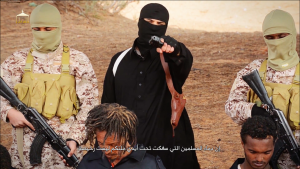 ISTANBUL, Turkey (Morning Star News) – In a video showing the cruel execution of 28 Ethiopian Christians, the militant Sunni terrorist group Islamic State (IS) says persecution of Christians is fundamental to Islam. In the video released late Sunday night (April 19), IS (formerly the Islamic State of Iraq and Syria) warns that if Christians in the Middle East and elsewhere refuse Islam, they also will be slain. An IS spokesman gives Christians three options – convert to Islam, submit to the rule of Islam and pay the Jizya (tribute) or be killed. The statement comes after the execution of 28 men identified by IS as, “The worshipers of the cross belonging to the hostile Ethiopian Church.” IS shows the 28 Christians divided into two groups of men being marched to their place of execution with their arms bound behind their backs. One group is held at a coastal area identified as “Wilayat Barqa” (Barqa State) in Libya, and the other is located inland in the desert scrub brush of “Wilayat Fazzan” (Fazzan State), also in Libya. The men in both groups are lined up and then forced to kneel in the sand. After a man who appears in at least one other IS video gives a statement, the men in the desert are shot in the back of their heads. The video switches seaside, where the men there are pushed down into the sand and their throats are slit. Then all the men are beheaded. The segment ends with close-ups of the heads of several victims being stacked onto their bodies as blood flows into the sea. Then the screen goes blank, and An-Nashwan appears. On Tuesday (April 21) the Ethiopian Ministry of Information confirmed the men were Ethiopian migrant workers who were living in Libya. Their identities, if privately known, have not been released. The government ordered a three-day official mourning period, set to conclude today. The video comes more than two months after IS released a video of the execution of 21 Christians, all but one of them Egyptian, on Feb. 15. The Ethiopians and the Egyptians who were executed on the beach appear to be executed in the same general area. The latest recording issues what could be termed a treatise on persecuting Christians. Using numerous citations from the two primary sources of Islamic authority, the Koran and the Sunnah (the sayings and actions of Muhammad), along with quotes from a consensus of Islamic scholars, IS labels Christianity a false religion and calls persecution of Christians a “fundamental” aspect of Islam that has fallen out of use in the modern era. Going further, An-Nashwan quotes numerous religious edicts issued in consensus by Islamic scholars regarding the treatment of Christians and Jews. The video is similar to previous IS execution videos with one major difference: In a recording that lasts just over 29 minutes, 24 minutes are spent explaining the Islamic version of the life of Jesus Christ, giving an equally inaccurate account of the history of Christianity and justifying persecution of Christians. In a possible attempt to give credibility to IS claims that “Dhimmi” (non-Muslims living under protected but second-class status) are treated well in Islamic society, several people who identify themselves as Christians in Raqqah, the de facto capital of IS in Syria, are interviewed. All claim they were well treated under IS rule. It is unclear what type of duress, if any, was used against the speakers during the filming of the video in Raqqah. Islamic State, in the wake of its 2014 push through Syrian and Iraqi, expelled the entire Christian population from several villages and cities in the region. In Iraq’s Nineveh Valley alone, IS threw out more than 15,000 Christian families, according to aid workers in the area. Those expelled reported forced conversions for those who couldn’t escape their respective communities, mostly the sick and elderly. In addition to forced conversions, those fleeing reported IS fighters seized their property and destroyed or occupied church buildings and monasteries, some of them several hundreds of years old.